Give a delicious gift of Congratulations that's also sophisticated and satisfying—a pairing of San Francisco-crafted Volpi® Salame with premium Cheeses from the fertile California wine region. All natural and expertly created, hand-tied Volpi® Salame perfectly complements the Fiscalini Cheddar and Sierra Nevada® Bella Capra Traditional Goat cheeses that are made using time-honored traditions and techniques. No herbicides or artifical fertilizers are ever used on Fiscalini and Sierra Nevada pastures. Arrives in an elegant willow basket with twill liner and Congratulations ribbon. It’s pure heaven for your favorite foodie. 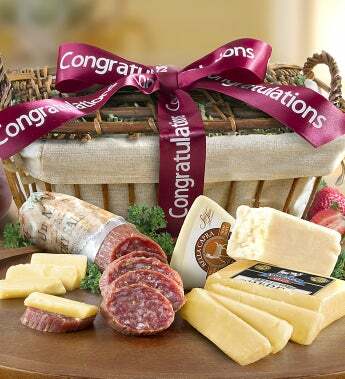 Give a delicious gift of Congratulations that's also sophisticated and satisfying—a pairing of San Francisco-crafted Volpi® Salame with premium Cheeses from the fertile California wine region. It’s pure heaven for your favorite foodie.